Fructose is found naturally in fruits and vegetables but also added to many processed foods and beverages. 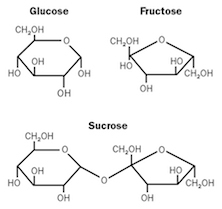 It is also one half of sucrose: otherwise known as table sugar. The consumption of a diet high in fructose throughout adolescence can worsen depressive- and anxiety-like behavior in animals and alter how the brain responds to stress, according to unpublished research presented at the annual meeting of the Society for Neuroscience in Washington D.C.
"Our results offer new insights into the ways in which diet can alter brain health and may lead to important implications for adolescent nutrition and development," says graduate student Constance Harrell. Harrell is working with Gretchen Neigh, PhD, assistant professor of physiology, psychiatry and behavioral sciences at Emory University School of Medicine, and briefed journalists on her lab's work at an "Unhealthy diet, unhealthy mind"-themed press conference at the Neuroscience meeting on Tuesday. Fructose, a sugar found naturally in fruits and vegetables but also added to many processed foods and beverages, can promote negative cardiovascular effects. It also stimulates neural pathways that affect how the brain responds to stress, which can have important behavioral effects, including the worsening of symptoms related to depression and anxiety. Such effects are of particular concern during the teen years, which is a critical time for the development of the brain's stress response. To determine whether fructose consumption has the potential to create long-term changes in metabolism and behavior during adolescence, Harrell and her colleagues gave both adolescent and adult rats either a standard or a high-fructose diet (55 percent of calories consumed). After 10 weeks, the adolescent but not adult rats on the high-fructose diet had a different stress hormone response to an acute stressor, which was consistent with their depressed-like behavior. A genetic pathway in the brain that plays a key role in regulating the way the brain responds to stress was also altered. These findings indicate that consuming a diet high in fructose throughout adolescence may exacerbate depressive behaviors and affect the way the body and the brain respond to stress. Rats fed the peri-adolescent high-fructose diet showed increased anxiety-like behavior in the elevated plus maze and depressive-like behavior in the forced swim test in adulthood, irrespective of stress history. They also showed elevated basal corticosterone but a blunted response to forced swim. These behavioral and hormonal responses to the high-fructose diet did not occur in rats fed fructose during adulthood only. Finally, rats fed the high-fructose diet throughout development underwent marked hypothalamic transcript expression remodeling, with 966 genes (5.6 percent) significantly altered and a pronounced enrichment of altered transcripts in the POMC pathway.